Back to the Future on Mercer Street | SoHo Memory Project. After a long and meticulous renovation and restoration, Fireman’s Hall, at 155 Mercer Street, opened as Dolce & Gabbana, the high-end Italian fashion brand, on April 11. As a retail space, the store is quite impressive. D&G’s designers went all out, creating curated graffiti-covered walls as a backdrop to (tastefully?) garish furniture. The article also describes Jenny, “the ring-tailed monkey. 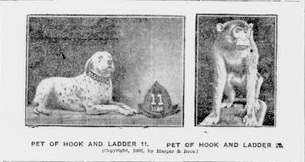 For 12 years Jenny served as mascot of Hook and Ladder No. 20, which was quartered at 155 Mercer. One time she woke the sleeping company to a fire in its own building by throwing billiard balls down a flight of stairs.” The SoHo Weekly News, November 29, 1973 The headline for the November 29, 1973 issue of The SoHo Weekly News (see above) announces “City Closing SoHo’s Historic Fire Station.” The brief article states that Engine Company 13 and Ladder Company 20 are moving out of the historic 155-157 Mercer Street building to a more modern building on Lafayette (where they and their Dalmatian named “20” still reside today) and that the building was to be returned to the real estate department of New York after 120 years of continuous use. The article goes on to say that the land was originally purchased in two pieces for a total of $3,900. After Hook and Ladder No. 20 moved out in 1974 leaving their cornerstone and memories of Jenny behind, the building was home to Masjid al-Farah, a mosque now located on West Broadway, for two years. The building was stripped of most of its features and details around this time. My mother remembers hearing the sound of sirens from our window replaced by the call to prayer. The city then sold the building to the Pellizzi Foundation in 1976 for $50,000, restrictive arts covenants were added in 1978, before it was resold to the Dia Foundation. When Dia moved to Chelsea in 1996, the restrictions were removed and it was sold to the Joyce Theater Foundation, who operated a dance performance venue there until 2014. I moved in next door to the firehouse when I was 5, just before it closed. My father tells me we were woken up at all hours by the sirens, as we lived on the second floor of 159, spitting distance from the fireman’s pole. The firehouse was an arts center for most of my life, until The Joyce Theater sold its building at 155 Mercer St. to Joseph Sitt’s Thor Equities for $27.25 million, according to the New York Post. $3,900 to $27.25 million over 160 years, quite an appreciation. 155 Mercer, along with most of the buildings in SoHo, is located in an M1-5A zoning district, which permits commercial and manufacturing uses. A City Planning Commission report dated July 23, 2014 states that the law"
… Thor Equities, has an unusual opportunity. For all intents and purposes there is nothing left of the original building. Thor could propose a contextual cast-iron type structure of five or six stories, or a shiny modern structure of the same height. But the developer needs a special permit to allow retail on the ground floor, and a restoration of the original facade makes such a permit easier to secure. Thor thus decided to recreate the old brownstone façade (although the brownstone is actually precast concrete) so that they could secure a permit for a retail store on the ground floor, instead of building a new “shiny modern structure” that would not be zoned for retail. Thor reverted to the past to move forward into the future. We get a tasteful recreation of the original building, and they get to put a store on the first floor. Is this a happy ending for everyone? For Thor, yes. For the residents of Mercer Street? I’d have to say bittersweet with a little more bitter than sweet. These days, however, that’s the most one can hope for!